A Joule Thief is a small low power circuit that uses up almost all the energy stored in its power source. 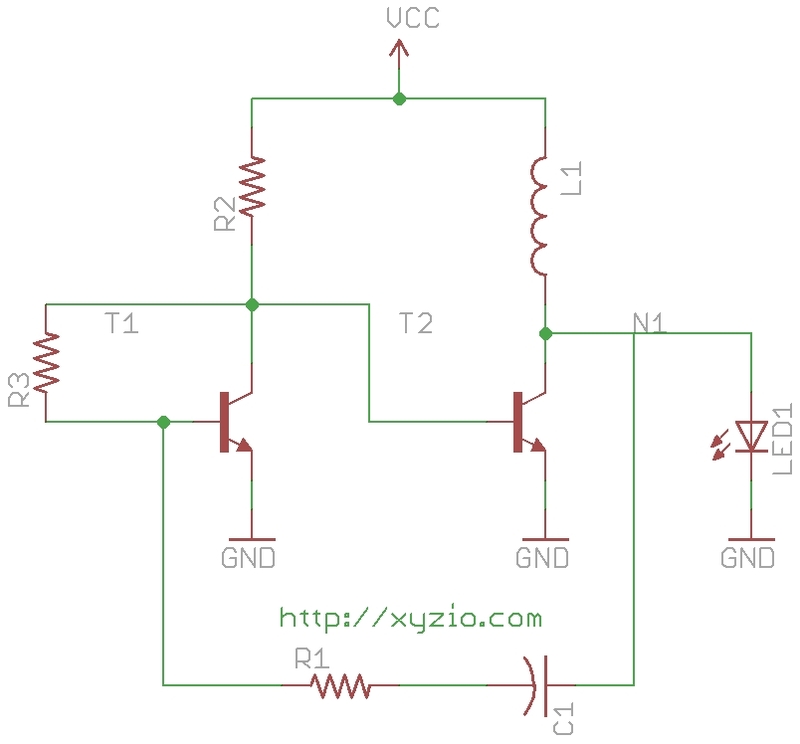 The circuit is based on the Boost DC-DC converter where the output voltage is higher than the input voltage. The circuit below is a type of Joule Thief that does not require a ferrite toroid core inductor. Looking at the schematic below – transistor T2 switches inductor L1 between ground and capacitor C1. When connected to ground, L1 charges up. When connected to C1, L1 acts as a current source and forces charge onto C1. This continues until node N1 is charged up to the Von of LED1. This lights up LED1 until the current flowing through the LED discharges node N1 to below its Von. This happens very fast (at several KHz) so to us it appears that LED1 is always on. T2 is controlled by transistor T1. T1 is in a negative feedback loop through resistor R3. Now, VCC is divided between resistor R2 and resistor R3. As the voltage across R2 increases, the voltage across R3 will decrease and vice versa due to the voltage divider they form. This increase and decrease across R3 switches T1 on and off. As T1 switches on and off and the voltage across R2 varies. This voltage change at the base of T2 switches T2 on and off. Unlike the other examples available online, I decided to make a board that did not require me to wire up additional components. My board contains the entire circuit as well as a AA battery holder. An AA battery is not required, the circuit should work at voltages up to 3v. A battery that is almost depleted will also work – so you can take the dead battery out of your flashlight and use it in this circuit to get some more usable light. With a good battery the circuit runs for about 10 days at full brightness and then slowly dims over the next few days. I’ve been able to get two full weeks (day and night) of usable light. This is a great circuit for night lights, emergencies, and camping. I also have a pre-built order at DirtyPCB where you can get 10+ copies for $12.